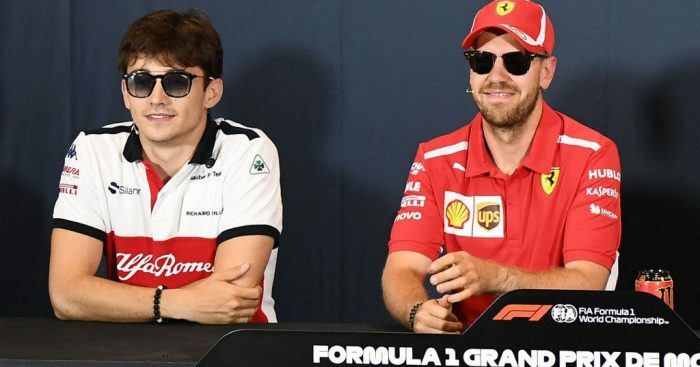 Sebastian Vettel insists he won’t play games with Charles Leclerc next season, he’s here to help his new team-mate as they try to win the titles for Ferrari. Next season Vettel will have a new team-mate as Ferrari bid farewell to Raikkonen and welcome Leclerc in his place. It is a massive step up for the Monaco driver, who will be the second youngest ever – at 21 years and 153 days old – to race for Ferrari. And while Vettel acknowledges it will be “different” to working with Raikkonen, who has been his team-mate since 2015, he is hoping for a good relationship with his new team-mate. “It’s going to be different for sure, because Charles is not Kimi and Kimi is not Charles,” Vettel said in an interview with Motorsport.com. “He is young, so he will have a lot on his head and a lot of things in his mind. “So I think for the team we need to work together on track. “I am sure he wants to beat me, [and] I want to beat him, the rules are clear. It was the same with Kimi. “I am his team-mate, so I am also here to help. “I am the last one that is trying to hide or playing any games or anything like that. But while Raikkonen is leaving Ferrari, he is not walking away from Formula 1. Instead the 39-year-old Finn has signed to race for Sauber and will be with the Faenza team for two years. Asked if he will stick around as long as Raikkonen has, Vettel repolied: “Well, its another 10 years from now to go as long as Kimi. It is a long time. It’s as long as I’ve been here, so now its half time basically. I don’t know.